Sanjay Thumma's Chicken Tikka is chicken cubes marinated with Indian spices and cooked in oven. Traditionally they are cooked in clayoven called tandoor. "Today I'm going to show you how to make another kabob, Chicken Tikka... For chicken tikka, I usually use thigh meat. "...You need to remove any moisture that is there on the meat because you want the marination to stick well. So, I did that with this chicken and I cut them into nice, small pieces. Now, I'm going to make the marination to go along with this. "Half a teaspoon of chili powder, a little bit of cardamom powder, a little bit of the --- mehti powder - that is the fenugreek leaves. And use a little bit of garam masala (hot masala). And use half a teaspoon of Coriander powder. Remember one thing, do not add to much of these masala powders because when you make chicken tikka, you want a less masalas possible, because you don't want these masalas to get burned and that could make it a little bit bitter..."
In recent times, I have been noticing a huge paradigm shift when it comes to online recipes. In the past, anyone who wanted to cook something would go to a recipe site, print out the recipe and then try to follow it. In the last couple of years, I have been noticing that the shift is towards online video recipes. The difference now is that instead of just having a recipe to print, you can also view the video and see how the recipe author intends for you to make the recipe. This is especially useful for new cooks, bachelors and people who are not familiar with all the ingredients in a recipe. With the popularity of blogging and podcasting, the trend these days is for recipe video podcasts and video blogs. In my quest for Indian cooking videos, I discovered that there are a couple of online websites that are mainly video recipe blogs. A site I found called Sailus Food has mouth watering pictures of recipes. There are no videos of recipes on this site though. 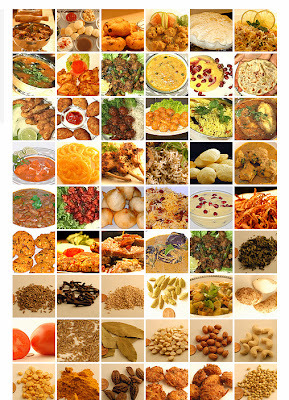 For video recipes, there is a site called VahRehVah.com which is run by a chef named Sanjay Thumma. Being a chef, Sanjay has lot of valuable information on his website and has plenty of videos to chose from. The other site that I really liked is called ShowMeTheCurry.com. This one was started by two Texans, Hetal and Anuja who demostrate how to make various Indian dishes in layman terms. Besides, they have great personalities. I happened to watch a live video chat they were having with their viewers and I was amazed by how they could keep their viewers engaged for a whole hour. This past weekend, I made Chicken Biryani, a tasty Indian recipe that is very popular among those who love Indian food. I followed each of the steps outlined in the video and guess what, my dish turned out fantastic. My family could not beleive that I had made it by following a video. After this experience, I am convinced that this is the way to go when it comes to recipes. I love trying out new recipes from blogs and other websites. One such website is vahrevah.com. The chef, Sanjay Thumma demostrates excellent recipes. These can also be found on youtube, rediff and some other websites. I love this recipe for chicken chettinad, which is different bcos it does not use coconut and is therefore healthier. The recipe for karela curry is from one of my fav blogspot, Shaheen's. The recipe can be found on Shaheen's blog. Thanks Shaheen. Heat the oil in a large pan. add mustard and cumin Add finely chopped onions, and fry till the onions turn light golden brown. Add turmeric, ginger garlic paste, curry leaves, and green chilli and saute for a while. Add chopped tomatoes . . Then, add the coriander powder and salt and mix well. Add the chicken to the frying pan and mix well, and cover and cook over a low-medium heat for 10-15 minutes or until the chicken is cooked through. Add a little water only if u need it. The chicken gives out some water. When the chicken is almost done, add the ground pepper into the mixture and mix well. Garnish with green dhania. sprinkle some lemon juice on top. What a way to remember "Sanjay the menace"! It has been so long and I have been wondering where you were. It is so weird. I have been married for about 10 years now Sanjay, and one fine morning my wife suddenly announced that she was interested in learning to make new dishes. I was thinking to myself that finally good times have arrived. Imagine my surprise when I went to Youtube to search for Indian cooking, and clicked on the first video that came up! I was shocked to see the face of my dear childhood friend. I knew you were a good cook, but I am really excited and happy to see your website and your videos. Obviously things have changed since we last met. I wish to tell all your vahrehvah users - I AM PROUD TO SAY THAT I AM PROBABLY THE FIRST PERSON OUTSIDE SANJAY'S FAMILY TO EXPERIMENT AND SURVIVE HIS COOKING HOBBY. Those were the good and happy days and I wish to share some very intimate moments of our childhood to give you a glimpse of this man. Sanjay me and other friends spent a lot of time together as young boys and had very happy days going out hunting, fishing and biking in the wilderness around our homes. Almost 27 yrs ago, with home-made bows and arrows, home-style kind of airguns, and our friends parents calling us 'dennis the menace' characters, we proudly roamed the streets of this beautiful green township called BHEL. We had so much freedom in this township and if at all a kid had to grow up and be a kid it was this place. My childhood was beautiful and I am so glad I spent it with sanjay that you know today as 'Vahchef'. Yes Sanjay Thumma was a good childhood friend! - Maybe not the model kid, but so much fun to be with! I was so happy to see that you mentioned my name together with all our friends when you shot the Sooji Halwa episode at Vahrehvah. You actually remember all our friends and that is so good. While my wife and I were watching you skin a chicken you claim to have learned this "fine skill" at catering college , but I think all your friends will testify that at age 10 we saw you do it similarly with the birds we caught. I can go on and on with adventures of our childhood – but all I want to say is that I am so happy to see you play this role on the world stage and internet these days. Instead of just influencing me and few others pals, it is nice to see you influencing what happens in so many kitchens. Why are you not telling your audience the truth about the fishing and fish eating episodes. I remember that eating fish we caught on the spot was your specialty- I still can remember when you would lit a flame even before we put the bait for fish! I remember how much fish used to be your passion. So when I saw you eat the fish and show the full bones – I was thinking that only your friends would understand where that devotion came from! Good show! Anyway keeping aside my friendship. Honestly I think this is a wonderful service to the food loving community and I sincerely hope that you make it to the top and stay there. As some of your visitors have indicated, it is indeed addictive. My wife may not realize it, but she is helping me to relive my childhood adventures and giving me the true taste of my memories literally. 'Tandoori Chicken', the name itself makes mouths water. It is a traditional chicken dish and originated in India. 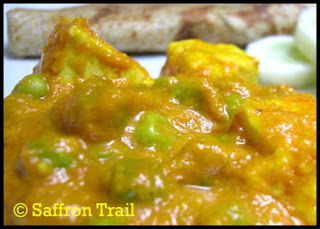 The chicken is marinated in yogurt and tandoori masala and cooked in the 'tandoor'. Tandoor is a cylindrical oven with a very high temperature. The tandoor generally maintains temperature as high as 800 degrees F. Those of us who know about 'tandoori chicken' know it as a restaurant delicasy. My knowledge about 'tandoori chicken' is that it is a restaurant dish made in the tandoor and cannot be made at home. After I started cooking, I've made tandoori chicken with the store bought 'tandoori chicken' masala. It tasted excellent. But I never even imagined that we could make the same tandoori chicken at home from scratch with ingredients on hand. It was only after I saw the 'big' chefs video that I knew about this. I did gave a try and guess what??? The results were more than excellent. It is so easy to make for pot luck parties because everything goes into the oven in one shot. Being from kanyakumari district, I'm a strict non vegetarian. I've had all kinds of non veg dishes. One of my favorites is 'turkey'. Coming to the US, I was very very fascinated by the 'Turkey' legs. I always wanted to try making that at home with indian spices but had many doubts about whether the spices would enter the meat etc. After seeing vahchefs video, I became really confident and went on to try 'tandoori turkey'. His idea of making slits really worked and even the innermost meat was full of flavour. Now tandoori turkey has become one of our new family favorites. This net is surely an amazing place, making a non-cook like me brave enough to try and experiment with stuff that actually tastes good is not an easy task. Check out the pictures and judge for yourself..
Fry marinated shrimp 450 gm (corriander powder, salt, red chilli powder, turmeric, ginger-garlic paste) in oil, few at a time and keep them aside. Soak Basmati Rice for 30 minutes and cook with oil, spices, and salt only 85%, do not cook rice completely. Fry yoghurt, spices, green chillies, corriander, mint, biryani powder, etc. and add fried shrimp to the mixture, stir it once and add the semi-cooked rice and cook it for not more than 10 minutes. No higher compliment can be paid to the Artist - the Master - the Chef Sanjay Thumma We love you so much. ……When I saw Dahi-wada 100++ I was thinking ye 100++ ka funda kya hai? But now know………..Congratulations on completing 100 video demos…...Keep up the good work…… I would love to say Thank you from bottom of my heart to your Father who inspired you. You guys are great. Regards to your parents, Regards to you and your friends who are helping you with this great work. Aruna & Raj. I am a new member at Vahrehvah.com and I am not that great a cook (I will be some day)– but right now I love food to no end. I also got my mom to try out some of your creations and now I have not only got her hooked onto my favouite website, but I also enjoy some superb cooking. But I am writing to you not because of the videos – which are no doubt great…But I am most excited about the link "Vah photos" – The reason is that I am a self proclaimed restaurant critique and am putting together a collection of food reviews for restaurants in the greater New York area. I also enjoy photography a great deal but I am yet to see food pictures that have the same quality that is in Vah Photos. This link is truly amazing. I could not believe my eyes when I saw that you have allowed these pictures to be royalty free. That is practically giving it away! And that is most generous. Not many people who take pictures of this admirable quality allow it's free use. The fact that you not only allow its royalty free use, but have posted such multitude of breath-taking shots, goes to prove that you practice what you preach about inspirational cooking. I was brought up to believe that there is no free lunch – but I am so thrilled to see that it is not the case on your website. Not only is the lunch free, but it is in beautiful glorious pictures for all to enjoy! What can I say?!! Vah reh vah… truly! And as a gesture of gratitude for your generosity in distributing royalty free food pictures, I have decided to do you a favour in turn and tell all my friends and acquaintances of your website so that you have a bigger fan following, a much larger community and everybody benefits in turn. This is community at its best. Hats off! Hello and glad to see you in the new year. Trying to stick to my resolutions (to blog more regularly) - I was ready with the draft 3 days ago, but that's when respiratory infection and bronchitis caught up with me and has kept me down for over 3 days. In Bombay, the temperature difference is well over 15 degrees between day and night, leading to an epidemic of sorts in respiratory infections. The only times in the last three days I've managed to drag myself into the kitchen, is to make a huge pot of Molagu Rasam (Clear pepper soup), and keep warming it up in the microwave, sipping the spicy liquid through the day. Apart from that, my diet has generally been antibiotics, antihistaminics, expectorants and mucolytics. Sounds like quite a spread right?? Back to the topic of the post - this is one dish that is an extremely popular Indian curry - the origins as far as I know being Punjabi in nature, the land where paneer has been predominantly used since many years. If one has paneer and frozen peas, this can be made out of the stuff you'd normally have in your pantry, bailing you out, if you got a day late in replenishing your stock of vegetables. For a person who cooks almost 3 meals each day, it's odd that I rarely make the typical restaurant style Punjabi dishes like Malai Kofta, Makhanwala and the likes, going mostly with the more earthy simple dishes, where veggies are not drowned in rich gravies and recipes which give veggies more respect than that! However on a whim I decided to try out this matar paneer curry, also since I had nothing else in my refrigerator that evening, except for the staple onions-tomatoes-ginger and garlic. 1. Heat the oil in a heavy bottomed wok. Start by sauteeing the broken cashews till lightly golden. 2. Next, add the chopped ginger-garlic and onions and cook on a low flame with a pinch of salt till they soften and turn light brown. 3. At this stage, add the tomatoes with the turmeric powder. Stir well and cook for 5-7 minutes, till mushy. 4. Remove the contents of the wok and blend to a fine puree in a blender, once cooled throughly. You may use upto 1/2 cup water to aid the blending process. 5. In the same wok, transfer the fine puree. Season with spice powders (red chilli powder, cumin coriander powder, garam masala) and salt. Simmer for 3-4 minutes till the gravy is infused with the spices. 6. Add the frozen / boiled green peas to this gravy and simmer for 5 minutes, after which the paneer cubes go in. Simmer for another 2 minutes, check for salt, sprinkle crushed kasoori methi and give it a stir. 7. 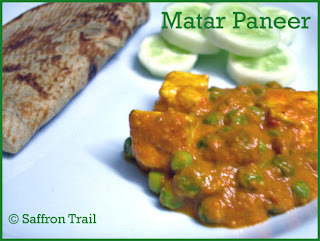 Matar paneer is ready to be removed in a serving bowl. Serve hot with rotis, parathas, naan or plain steamed rice seasoned with cumin seeds. I personally prefer to have this with a plain tandoori roti or a phulka as the dish is quite heavy, it is better balanced by a lighter bread. A raita on the side would be nice too, or a simple cucumber salad. It's perfectly okay to use store bought paneer.Using paneer made from skimmed milk at home will further reduce the calories from fat keeping the protein content intact. In restaurants, this dish is made with plenty of ghee /butter, a large chunk of nut paste (almond or cashew) plus a dollop of fresh cream added towards the end to make it even richer. This version uses just one teaspoon of vegetable oil and the small quantity of cashewnuts are enough to provide the rich creamy restaurant taste without the added calories from fat. The key to a delicious gravy is to not skimp on the onion sauteeing and make a really fine puree using a good quality blender. The pinch of kasoori methi in the end makes all the difference in giving that 'restauranty' flavour. Vegans can substitute the paneer with tofu or boiled-drained soya chunks (sold in Indian stores under the brand Nutrela).